Quite a few professional musicians use the guitar to write songs because it is so portable. You can’t easily transport a piano on a tour bus or play while sitting on the beach. Musicians are able to pick out the tune in their head on a guitar no matter where they are sitting. They can jot it down the song’s basic structure on a piece of notebook paper to flesh out into a full song later. The guitar’s versatility is what makes it a great instrument to learn how to play. The versatility of the guitar is also why it is great to use when playing a wide range of music. A guitar can be adapted to whatever musical style you enjoy, whether it’s jazz, rock or even classical. If you learn how to play the guitar, you can play just about anything. You can learn the basics of the guitar in one night and build on that knowledge as you learn more difficult things. It is a fulfilling experience and very rewarding. Consider this: you have friends that play the guitar and enjoy music as much as you do. 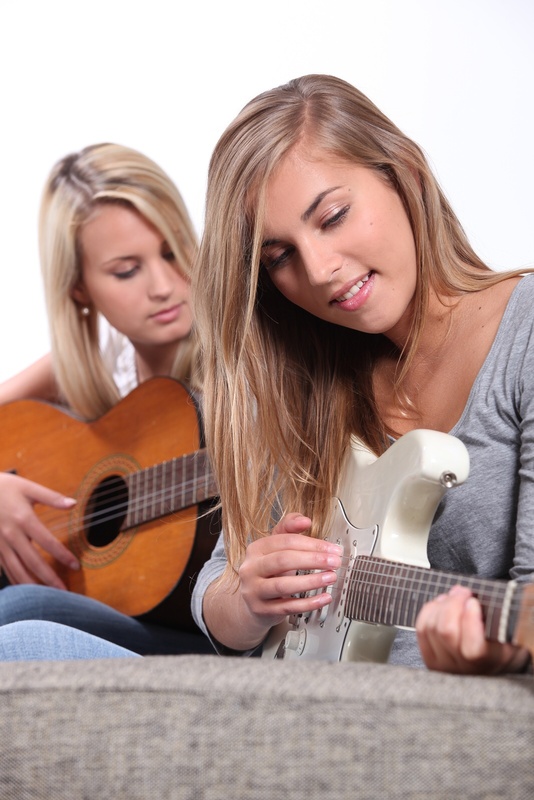 By learning how to play the guitar, you and your friends can move from having a boring evening to an impromptu jam session. Playing with friends is fun and you can learn different things and techniques from other players. Additionally, you can also write and play original songs that you and your friends compose. Hopefully this is enough inspiration to make you finally decide to learn how to play the guitar. The first thing you need to do is to purchase a guitar. You do not have to have the best guitar on the market in order to play. You simply need a good quality instrument. It’s a good idea to visit a music store that sells guitars and has a knowledgeable staff to help you decide on the right instrument. Keep in mind that each guitar has a different sound and the more money you put into the instrument, the richer the sound you will get. You should be able to get a great sounding guitar for a decent price. If you cannot afford to purchase your own guitar, see if a friend has one they are willing to loan you or talk to the staff at a music store about renting a guitar. It is recommended that you start with an acoustic guitar, learn how to play it proficiently and then move onto an electric guitar. Electric guitars have additional effects to them that change how they sound. They are also very good at masking poor guitar playing. When you learn on an acoustic guitar, you learn the proper technique that keeps your notes and chords crisp and clean. Additionally, learning on an acoustic guitar allows you to learn a variety of different styles of playing instead of limiting you to the styles that are most commonly played on an electric guitar. You will be able to learn how to play faster and it will help you decide whether or not you want to invest in an electric guitar. If you are more interested in playing classical style guitar or simply strumming along at a sing along, an acoustic guitar is all you need. Regardless of what type of guitar you purchase you should make sure that you purchase a guitar stand. The stand allows you to store your guitar safely while still keeping it in sight when you are not playing. It allows the guitar to be a constant reminder that you need to practice and you will be prone to play it more often. If you opt to purchase an electric guitar make sure you keep it plugged into the amp so that you can simply pick it up and start playing with a flick of the switch. Just like any learning any other instrument, it is important that you practice. You can learn the basics in one night – the names of the strings, basic chords, etc. – but you have to practice in order to get proficient at it. If you practice regularly, you will improve you playing. The more you practice, the better you will get. A good way to practice and to keep you motivated is to find sheet music of the songs that you enjoy listening to. You will feel accomplished when you learn how to play your favorite songs. If you love music, consider learning how to play the guitar. It is a great artistic outlet and it is one of easiest instruments to learn how to play because it is so versatile.